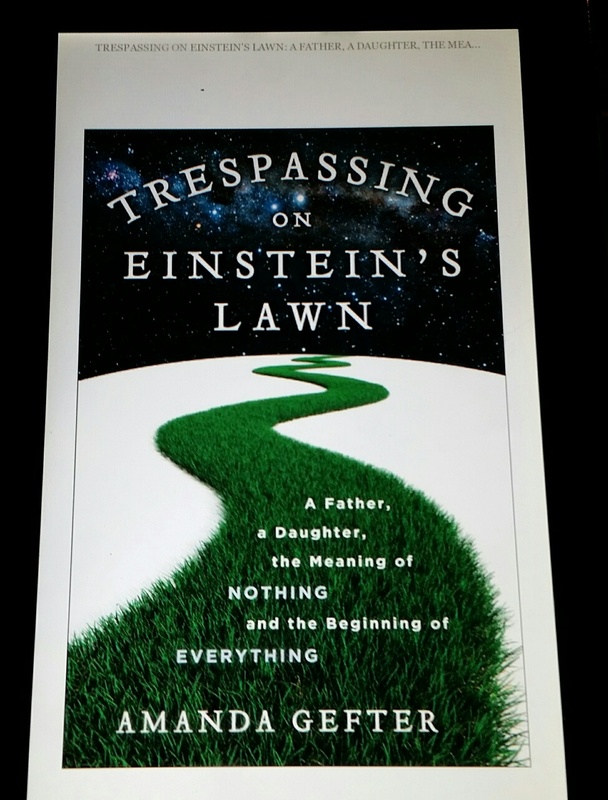 So if you’ve been reading any of my Facebook posts, you’ll know that I’ve veered off fiction lately and have been reading Amanda Gefter’s Trespassing on Einstein’s Lawn: A Father, a Daughter, The Meaning of NOTHING and the Beginning of Everything. I was going to start this post with some punny/funny title that tied together fiction & physics, and you’ll see (if this post goes as planned) that I am ultimately connecting modern physics with my writing. But every title I came up with might have been right (physics-wise), or it might have been wrong, leaving me open to much criticism that I don’t understand what I’ve been reading. Mostly, I’m happy with keeping my reading at ~98.999873% fiction. Occasionally, though I like to dig into a few types of nonfiction. Good memoir, I love. And I crave really WELL-WRITTEN history that gets at the people and the puzzles of whatever time I’m reading about–rather than just the leaders and politics and wars and whatever else you want to throw in to make me yawn. (Two examples of the kind of history I love to read–Amy Butler Greenfield’s A Perfect Red and Laurence Bergreen’s Over the Edge of the World.) And then I love science. But…and here’s the rub, folks, the science has to be REALLY, REALLY, REALLY WELL-WRITTEN. Because, even then, I’m not going to understand all of it, and when you get into quantum physics, the percentage I’ll comprehend drops even lower. Amanda Gefter writes REALLY, REALLY, REALLY WELL. Gefter gets as excited about physics as I do about, well…fiction. She gets as tangled up in a conversation about relativity and event horizons and the nature of reality as I do about plot points and rising tension and character consistency. I give you, as evidence, her description of what happened when she went to pick up her nametag (and her father’s) at the first physics conference she basically snuck/faked her way into. Pretty much exactly my reaction when I met Bruce Coville (okay, yes, “met” meaning I made it to the front of his book-signing line) and got to tell him how much I wished his Sixth Grade Alien books were still in print. So, yes, the book is clever and funny and will make you laugh many times over. If there’s anyone in your family who will get any of the physics references, you’ll be reading sections out loud to them to share the laugh and/or the awe. But, more important than that, I think Gefter makes this stuff about as understandable (for me, anyway) as anybody could. How do I know? Well, first, because I’m still reading. But also because every now and then I take a break and summarize what I’ve got to my husband, who has read a LOT more about this stuff than I have, and he doesn’t say, “That fits absolutely nowhere into what I know about physics.” He nods and says, “Okay,” and I go back to the book and keep going. When i started this book, I hoped I was going to get a better understanding of what we (“we” being the mathematical set that includes all these physicists, not the mathematical set that includes me) know about the universe. I was, I’ll admit it, looking for some facts, facts I could use as building blocks to give me a base from which I could grow my own knowledge. And what Gefter has shown me so well is that I don’t actually have to get those facts. In fact (see what I did there? ), there aren’t actually that many facts to learn! Okay, this is where I may be getting in over my head and where, to anybody who actually does understand this stuff, I may be making that obvious. But here are my takeaways. We don’t know all that much! We have theories. Oh, man, we have theories out the wazoo. And we do have a decent amount of mathematical proof for some of those theories–if not in their entirety, for some big chunks of each. And while I can’t do the math, I’m willing to accept that if/when the math works out, this means something. We also have a whole lot of questions. It seems to me that these physicists are using the scientific method to the max. They are asking questions left and right and then they are creating hypotheses (which often sound a lot like science fiction premises), and then they are testing them. They’re testing with both math and evidence, when and if they can get any evidence. And someone comes up with one answer and someone else comes up with another answer and then they argue for a while until someone else does some more math or finds some other evidence and–occassionally–they prove something. But whatever happens, they keep asking. Boy, do they keep asking. And it’s these questions that are actually what Gefter is helping me understand. No, I’m not going to list them–I told you, I’ll get them wrong, and someone will tell me I don’t understand, and we’ll be back at that Duh. But I promise you; I’m getting them while I read them. It is amazing. I can’t even really imagine the brains behind these ideas, the brains that go back and forth with each other in almost entirely theoretical conversations and that keep track of everything they’ve read and heard, everything they believe, and everything they’re thinking up as a new possibility right in that minute. Okay, yes, I can do that with the Harry Potter world, and I can give you any number of reasons why Mary Lennox does not (no matter what the movie says) grow up to marry her cousin Colin. But these aren’t black holes and universes that are one-sided coins and the place at which Einstein and Newton’s theories no longer conflict. Just saying. All right, I promised you a connection between physics and writing. You ready? If these guys can throw out these totally bizarre ideas that stretch imagination to the breaking point, and then they can test them and find the pieces that work and the pieces that don’t, and then they can keep going…I can throw any words and sentences on the page I want and then revise them. But really this post is not about me or my writing (another duh!). It’s about a really fantastic book that, if you can push all those novels to the side for a week or two, you should pick up and read. I’m at 57%, and the last sentence I just read is, “Particles, strings–they were just two ways of looking at the same thing.” Oh, yeah, you can bet I’m going to keep reading to the end.